In volume 20 of the African Development Perspectives Yearbook with the title “Science, Technology and Innovation Policies for Inclusive Growth in Africa - General Issues and Country Cases” major strategic and policy issues are analysed. The guiding issue is how to make Science, Technology and Innovation (STI) Policies relevant for inclusive growth strategies in Africa so that socio-economic transformation strategies will take off. Although STI polices are considered as indispensable for sustainable growth in Africa, the steps towards such policies and strategies are not yet streamlined enough. Therefore, it is necessary to learn from the successful cases of STI development in Africa and in other emerging countries. In this volume a new approach is envisaged. Based on Africa’s deep-routed structural problems, the STI policies are related to Africa’s economic transformation agenda. In a first part of Volume 20 the general issues of introducing effective STI policies are presented, based on visions, strategic plans and the requirements of functioning national innovation systems. In a second part, country case studies highlight the new approach. Specific case studies, such as for Sudan and Nigeria, are presented, as these two countries have a long history of STI development. Strategies and policies for more coherent STI policies are presented (see the Cover of volume 20: PDF 91042-4 Alabi). Complementary to this volume is Volume 21 with the title “Science, Technology and Innovation Policies for Inclusive Growth in Africa - Human Skills Development and Country Cases”. In the first part of Volume 21 the role of human skills development for capacity building in STI systems is discussed. This is based on examples from Cameroon, Nigeria and Mauritania. In the second part the national innovation systems and STI policies of North African countries (Egypt and Tunisia) are evaluated, to assess how they can be directed towards economic transformation and inclusive growth. With Volume 21 the African Development Perspectives Yearbook project is approaching 30 years of activity as the first volume was published in 1989 under the title “Human Dimensions of Adjustment”. In these 30 years the African Development Perspectives Yearbook has become the major annual publication in English language on Africa in Germany. Guiding principle is the inclusion of authors and editors from Africa, the publication of essays which are also readable by media people, development actors and policymakers, and the presentation of successful policies, projects and programmes which highlight that Africa can succeed in regard of its ambitions and that it can rise in growth and development. The Research Group on African Development Perspectives has just released the International Call for Papers for Volume 22 (2020) and invites Abstracts and nominations for the position of Guest Editors (see International Call for Papers Volume 22, for the year 2020). Invited are contributions for Volume 22 (2020) of the African Development Perspectives Yearbook with the title “Sustainable Development Goal 9 (Infrastructure, Industrialization, Innovation) and African Development – Challenges and Opportunities”. See the International Call for Papers for Volume 22 (for the calendar year 2020). The contributions should be evidence-based and policy-oriented. High academic standards are requested and will be checked by referees. Non-technical papers with deep analysis, which are readable by practitioners in development cooperation and by media people, have a high priority in the selection process. The concept of the contribution and the methodological framework of analysis should be outlined in the Abstract which is submitted to the Editors, Professor Karl Wohlmuth (Bremen) and Professor Tobias Knedlik (Fulda). Upon acceptance of the paper, the Contributors will receive Editorial Guidelines and a Template. Accepted papers will be grouped into Thematic Units, and the respective Unit Editors will contact the contributors quite regularly during the process of finalization of the paper to discuss the various drafts. The African Development Perspectives Yearbook is published since 1989 (see the link to the website of the Yearbook project: http://www.iwim.uni-bremen.de/africa/africanyearbook.htm). 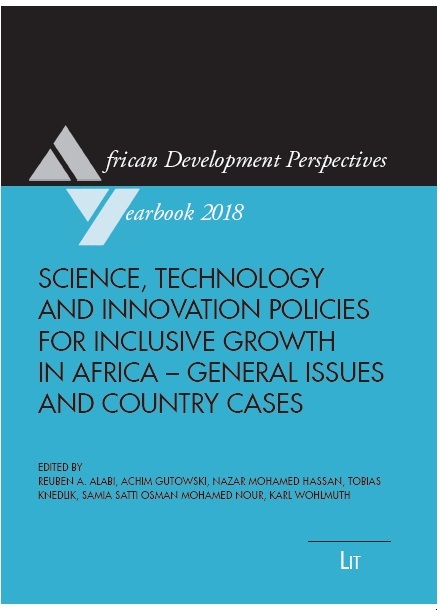 The volumes 20 and 21 (for the years 2018 and 2019) were on the theme “Science, Technology and Innovation Policies for Inclusive Growth in Africa”. In 2019, the Research Group celebrates the event of 30 years of publishing the African Development Perspectives Yearbook. Each of the volumes 20 and 21 had three Thematic Units. Volume 22 will be related to the year 2020; in case of many high-quality submissions a Volume 23 for the year 2021 can be added. Guest Editors for various Thematic Units are also invited to apply. Editors of Thematic Units are also becoming automatically the status of Volume Editors. Guest Editors are responsible for a Thematic Unit with 3 – 5 contributions and an Introduction. For specific themes see the Main Issues proposed by the Editors for Volume 22 as presented in the International Call for Papers Volume 22 (2020). These proposals for themes are only examples. The Editors are open to further suggestions in the context of SDG 9..
e) enhancing scientific research, upgrading the technological capabilities of industrial sectors, and encouraging innovation. Focus in SDG 9 is also on facilitating sustainable and resilient infrastructural development, on supporting domestic technology development, research and innovation, and on increasing access to information and communication technologies. The contributions will add to the knowledge about the role of SDG 9 for sustainable development and inclusive growth in Africa. 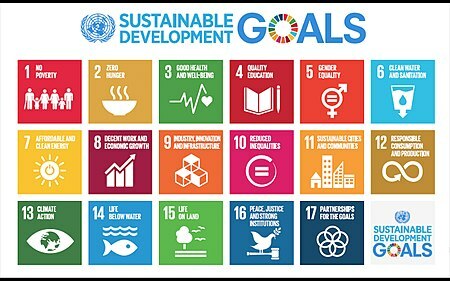 Understanding the links to the other 16 SDGs of the Agenda 2030 is of great importance when drafting contributions for volume 22 of the African Development Perspectives Yearbook. The contributors should consider the links to, the spillovers from and the interactions with the other SDGs. A new research and strategy paper on “Sudan in the 21st Century: Seeking Pathways Forward” was published as the number 43 in the SUDAN ECONOMY RESEARCH GROUP (SERG) DISCUSSION PAPERS series at the University of Bremen (see the link to the SERG series: http://www.iwim.uni-bremen.de/publikationen/pub-sudan.htm). Author is Dr. Mohamed al Murtada Mustafa, Former Undersecretary of Labour, Ministry of Labour, Sudan and Former Director of ILO Offices in Harare and Cairo. The paper argues that for a successful reconstruction of the Sudanese economy five pillars are needed: education, entrepreneurship, agriculture, industry and management. These five pillars represent the main sectors and functional areas which must interact for inclusive growth to occur. Interaction depends on institutional reform and on a developmental role of the civil service. The separation of South Sudan in 2011 has fundamentally changed the situation of Sudan, and it is no longer possible to pursue uncoordinated, short-term and small-scale policy changes. Much more is needed – long-term structural strategies and deep policy changes must be implemented in Sudan. 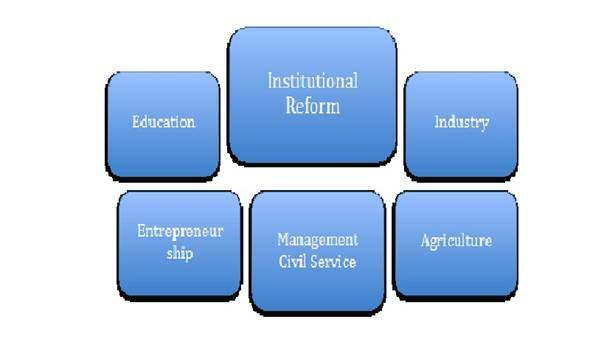 Fundamental reforms are proposed in the study and policy recommendations are presented for these five pillars. The author emphasizes also the fact that the Sudanese government has seen a great number of advisory and consultancy reports on economic strategies since 1956 when the country became independent. All these proposals and suggestions from donors, think tanks and international organisations were well-minded and valuable but were repetitive in content and never were implemented (neither by democratic governments nor by military regimes). Therefore, a new approach is needed by focussing on a developmental civil service and a new leadership for the country which is based on a broader group of policy actors – coming from all regions of the Sudan, from representative political circles and from significant parts of the civil society. Such an approach is formulated in the new SERG study. Professor Karl Wohlmuth from the University of Bremen has peer-reviewed and re-edited the paper by Dr. Murtada. It will also be circulated in Arabic language by the author. The new volume of the African Development Perspectives Yearbook – number 20 for the year 2018 – has also a strong strategic focus on Sudan; emphasis is on the strengthening of the National Innovation System (NIS) and the Science, Technology and Innovation (STI) Policies of Sudan (issue one), on developing new policies to support innovative industrial enterprises (issue two), on attracting foreign enterprises and stimulating the technology transfer to domestic firms (issue three), and on increasing the yield in agriculture through R&D and appropriate dissemination of research results to the farming sector (issue four). Over the years the African Development Perspectives Yearbook has published regularly on Sudan and South Sudan and so has participated actively to the discussion on new development strategies for these countries (see the link to the Yearbook editions: http://www.iwim.uni-bremen.de/africa/africanyearbook.htm). The research on Sudan by the SERG is summarized in the report on Sudan Studies in Bremen (see the link to number 38 on “Sudan Studies in Bremen 1979-2011”: http://www.iwim.uni-bremen.de/publikationen/pub-sudan.htm). Most of the papers published by the SERG have a focus on strategies and policies to advance structural change in Sudan (and in South Sudan). 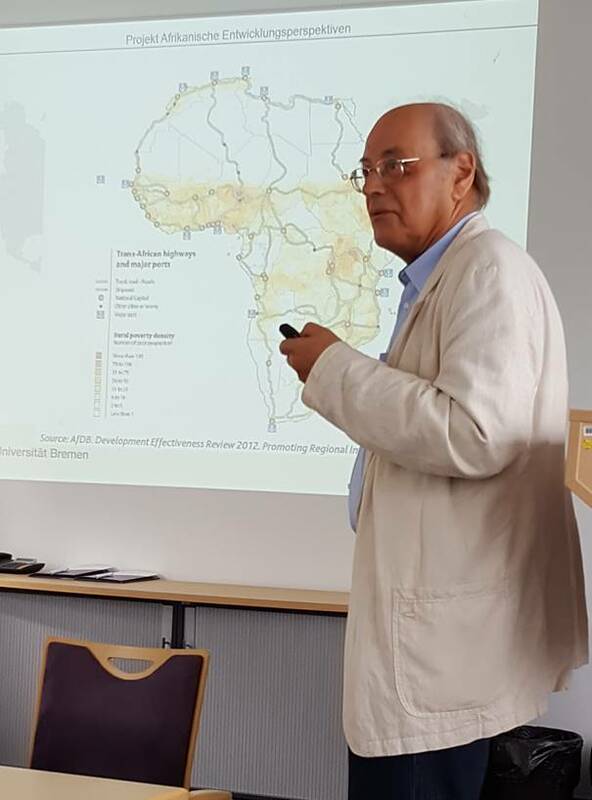 Professor Karl Wohlmuth gave a Keynote Lecture on “Transport Infrastructure and Regional Integration in Africa – A Neglected Link” at the second “Aviation in Africa” International Workshop which was organized in June 2018 by the Institute for Transport and Development (ITD) of the Hochschule Bremen (City University of Applied Sciences Bremen) on behalf of the international scientific organization GARS (German Aviation Research Society). Professor Wohlmuth emphasized in his lecture the following themes: Scoping the neglected link of transport infrastructure and regional integration; New Initiatives to link Infrastructure, Continental and Regional Development in Africa; Transformative Regional Integration and Infrastructure Development in Africa; The “Infrastructure State”, Regional Integration and Aviation Development in Africa; and Conclusions –Way Forward in Africa. More than hundred experts on aviation and development participated at the three days meeting in Bremen (see the PDF Programme and the PDF Power Point Presentation). Professor Wohlmuth argued in his lecture that a new approach towards transformative regional integration is needed for Africa to overcome the bottleneck factors which impede structural change in Africa. Not trade liberalisation is the key priority issue of regional integration, but structural transformation between and within economic sectors. This “transformative regional integration approach” contrasts with the “linear regional integration model” which was inherited in Africa from the European integration process. Also, it was strongly emphasized that transport infrastructure development is biased in Africa as roads construction (within the countries and at cross-border level) is still the key transport sector development business. Other transport modes, like railways, aviation, waterways and rivers, and ocean shipping, are still neglected. But most seriously, the mobility concepts are not clarified in Africa; it is not made clear how the transport modes are really used (by producers and consumers). Huge investment projects are agreed upon in the context of national, regional and continental transport development programmes, but financing, implementation and maintenance levels are weak, and the social, commercial and economic benefits of the projects are not always made clear. 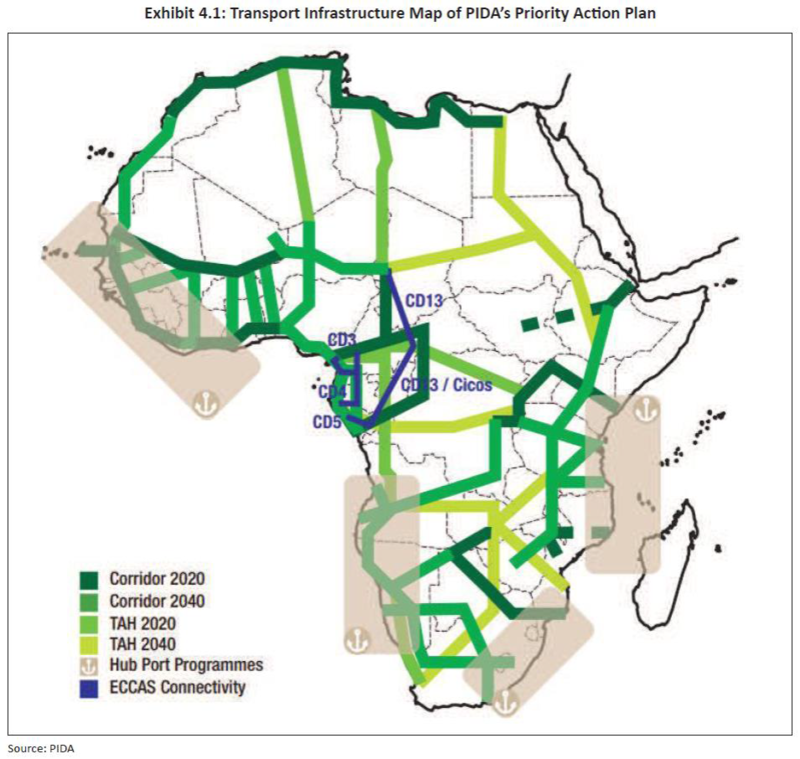 The map of PIDA’s Priority Action Plan (see below) shows how neglected other transport modes than roads (along the Corridors and the Trans African Highways routes) are and will be until 2040. Aviation has huge developmental advantages for Africa, but this transport sub-sector is still neglected in all decision-making processes, at national, regional and continental African political and governance levels. The observed progress of Africa in terms of ICT (Information and Communication Technology) and STI (Science, Technology and Innovation) development indicators gives hope and will facilitate the build-up of an aviation infrastructure. Aviation has huge effects in Africa on employment, industrialization, technological development, skills and human resources development, regional development, export development, mobility of people, goods and ideas, and especially on the opening of economies for trade, investment, technological innovation and skilled migration. The proposed publication project for volume 22 of the African Development Perspectives Yearbook on “Sustainable Development Goal 9 (Infrastructure, Industrialization and Innovation) and African Development – Challenges and Opportunities” will consider the issues of a more balanced transport infrastructure in Africa as a base for a broad industrialization advance and the speeding-up of innovation processes in African firms (see PDF International Call for Papers for Volume 22, 2020). Members of GARS and other experts on aviation in Africa are invited to submit their Abstracts to the Editors of the African Development Perspectives Yearbook (see the link to the Yearbook programme: http://www.iwim.uni-bremen.de/africa/about.htm). Professor Karl Wohlmuth has given advice to the Promotions Committee of the Federal University Of Technology in Akura, Nigeria. The Promotions Committee is responsible for the appointment of Professors and Associate Professors. Professor Wohlmuth was asked to evaluate candidates on the basis of their publications and overall qualifications for the position in question. It is a sophisticated multi-stages system of evaluation for the promotion to the rank of a Professor and an Associate Professor. Karl Wohlmuth was invited for this function by the Vice-President of the University and by the Head (Secretary) of the Promotions Committee. The Federal University of Technology is a leading University in Nigeria. Also, Professor Wohlmuth has advised the Promotions Committees of the University of Khartoum (Sudan) and of the University of Juba (South Sudan) concerning appointments to Full Professorship. The University of Khartoum is on the way of reorganizing and strengthening its academic profile to regain the leading position which it had after independence among African universities. The University of Juba, as well as other universities in South Sudan, are still suffering because of the civil war in the country and the serious governance problems. Professor Wohlmuth was also active as a reviewer of manuscripts, book proposals and articles for peer-reviewed journals. The Canadian Journal of Development Studies asked him to review manuscripts. This journal is now a leading journal on development studies in North America. The UNU-WIDER Institute in Helsinki asked Professor Wohlmuth to review a contribution for an international journal. UNU-WIDER is the globally leading institute for development research. Professor Wohlmuth was also active for the Journal Of International Development, for the journal Comparative Economic Studies, and for various African journals. Again, Professor Wohlmuth was asked to review proposals for book publications for the Economics Book Editions programme of Routledge Publishers. Professor Wohlmuth was invited to advise a leading German multinational on issues of Customer Assessment to Optimize Business Models in Africa. As there are increasing business relations with Africa, the role of different groups of customers (by size, sector, and country) is becoming more and more relevant. It is therefore important to optimize the business models in Africa accordingly. A preparatory group of the German multinational company is involved in writing the first draft of the assessment. Professor Wohlmuth has given advice and was peer-reviewing a Strategy Document on Revitalizing Sudan which was written by Dr. Murtada Mustafa. The Strategy Document is emphasizing five core pillars (Education, Entrepreneurship, Agriculture, Industry, and Management/Civil Service), which are considered as the basis of a new development strategy for Sudan. Dr. Murtada Mustafa was the first permanent Undersecretary of Labour in the government of Sudan. He has also had various leading functions in the International Labour Office (in Geneva, Harare, Cairo, and Khartoum). The Strategy Document will also be published in the Sudan Economy Research Group (SERG) Discussion Papers, and it will be circulated to policymakers inside and outside of Sudan. It will be published in English and in Arabic languages. Professor Wohlmuth is also supporting and advising two Guest Researchers at the Faculty of Economics and Business Studies, University of Bremen: The agricultural economist Professor Reuben A. Alabi, Department Of Agricultural Economics, Ambrose Alli University, Ekpoma, Nigeria is in Bremen for the period 2015-2018, and the international economist Professor Chunji Yun from the Faculty of Economics, Seinan Gakuin University, Fukuoka-City, Japan is in Bremen for the period September 2017 to August 2018. For both researchers this is a further stay for research programmes, in cooperation with Professor Wohlmuth, at the University of Bremen and at IWIM. Both researchers have published in the various IWIM Publications Series. Further publications are expected from this research period. Professor Alabi is doing researches on waste management and related value chains in Nigeria (comparing such value chains with the ones in Germany) and on aspects of the agricultural transformation in Nigeria. He is also these months working as a research fellow at the International Monetary Fund (IMF) in Washington D. C. in their African Department to do research and to give advice on the E-wallet fertilizer subsidy scheme which was introduced in Nigeria by Akinwumi A. Adesina, at that time the Nigerian agriculture minister who is now the President of the African Development Bank in Abidjan. It is the purpose of the assignment to the IMF to look at the possibilities of a wider use of the Nigerian E-wallet fertilizer subsidy scheme in other African countries. Professor Alabi and Professor Wohlmuth cooperate in Bremen on editions of the African Development Perspectives Yearbook concerning aspects of Nigeria’s economic and agricultural transformation. Most recently, Unit 2 of Volume 20 (a Unit is a collection of essays for a specific theme, introduced by the editors of the Unit) was finalized on “Science, Technology and Innovation Policies for Agricultural Transformation in Nigeria”. A strategy was outlined on the basis of the Unit 2 by Professors Alabi and Wohlmuth. The researches by Professor Chunji Yun centre on the European integration process. He is interested in the fact that the European Union (EU) has 28 (later after Brexit 27) employment regimes and labour policies, so that cross-border investments by firms through global and regional value chains have implications for the national employment regimes and the still national labour markets. He investigates the implications of cross-border investments on nationally organized labour markets for two sectors (automobiles and electronics). He will analyse the different sectoral structures of the value chains which are demanding different types of labour by function at different levels of skills and at different places; these cross-border investments and value chains are then leading to quite different labour market outcomes. He concentrates in his research work on the cross-border investments of German companies in the Visegrad countries to study the repercussions of the changing value chains on the national labour markets and the national labour policies in Germany and in the four Visegrad countries. Because of the fact that Bremen is a centre of production networks, such as for automobiles and automotive parts, there is also the possibility for Professor Yun to visit production sites in Bremen. Professor Wohlmuth and Professor Chun have discussed the first research report in December 2017; the second research report is due in February 2018 for a further intensive discussion and review. Sudan: From an oil-based economy to an agriculture-based and science-based economy? Prominent Sudanese scientists from universities and research institutions in Sudan and at UNESCO Cairo and Professor Karl Wohlmuth from the University of Bremen are launching a new strategy for a transition of Sudan from an oil-based development path towards an agriculture-based and science-based development model. This is a part (Unit 2) of the forthcoming Volume 20 of the African Development Perspectives Yearbook on “Science, Technology and Innovation Policies for Inclusive Growth in Africa. General Issues and Country Cases”. Professor Dr. Samia Satti Osman Mohamed Nour and Professor Karl Wohlmuth contributed an Introductory Essay to the theme under the title: “Science, Technology and Innovation (STI) Policies for Sudan’s Economic Revitalization - An Introduction”. The Unit 2 in Volume 20 of the African Development Perspectives Yearbook with the title: “Science, Technology and Innovation (STI) Policies for Sudan’s Economic Revitalization” has four additional essays. Professor Samia Satti Nour presents an analysis of the national innovation system (NIS) of Sudan, by focusing on three subsystems, the education institutions subsystem, the science & technology institutions subsystem, and the ICT institutions subsystem; the weaknesses of the NIS are highlighted and an agenda for action is proposed. She also presents in a second essay an analysis about innovative industrial firms in Sudan, focussing on two internationally active Sudanese conglomerates in the food industry, on two large-sized companies (belonging to the chemical and food industries) and on two medium-sized companies (belonging to the metal and textile industries). The purpose is to assess how innovative these companies really are and how they could improve their innovation performance. It is also measured by a new analytical approach how far away these companies are from the innovation frontier, and it is analysed what the government and the private sector can do to stimulate STI in the Sudanese companies. Migdam E. Abdelgani, from the National Centre for Research (NCR), Environment, Natural Resources and Desertification Research Institute (ENDRI), and Nazar Mohamed Hassan, from the UNESCO Cairo Office, provide an essay on the impact of agricultural research on the agriculture yields in Sudan. ENDRI has recently launched the Environment and Natural Resources International Journal (ENRIJ), with volume 1 and number 1 published in 2016 (link: http://www.sudanknowledge.org/journals/enrij/); ENDRI is a key research institution in Sudan. This essay is analysing the factors which are impeding yield increases in Sudan, but this essay is also using the example of the national crops campaigns in Egypt (such as for rice production increases) as a model of large-scale testing of agricultural research results in the field. Finally, the Unit 2 on Sudan in Volume 20 presents an analysis by Mohammed Elhaj Mustafa Ali from the University of Kassala and the Sudan International University (SIU) about knowledge spillovers from foreign investors in Sudan to local companies. Although the oil-based growth in Sudan has attracted mainly investment for the oil sector, foreign investment was also incoming to supply the growing Sudanese consumption market and to invest in agriculture and services sectors of Sudan. The essay on knowledge spillovers from foreign direct investors to domestic firms in Sudan gives also an agenda of how to stimulate technology transfers from foreign firms to domestic firms. In the Introductory Essay by Professor Samia Satti Nour and by Professor Karl Wohlmuth also an Agenda for Reforms aimed at Economic Revitalization through STI Development is presented. The Strategy proposed has short-term to medium-term to long-term implications for reforming institutions and policies. Professor Samia Satti Nour is a prominent researcher on STI development. She recently has obtained a full professorship at Khartoum University (see the PDFs of the Inaugural Lecture/ICT Development in Sudan and the Inaugural Lecture/Academic Profile of and Awards to Professor Samia Satti Nour, as well as the PDF on the Abstract in English and in Arabic of her Springer Book ICT in Sudan). Professor Wohlmuth was invited to attend the inaugural meeting at the University of Khartoum. Professor Samia Satti Nour is adviser to the African Development Perspectives Yearbook programme for Volume 20 and Co-editor of Volume 20. Recently she has presented a Policy Note on the multiple Digital Divides in Africa for The Nordic Africa Institute (see the PDF: NAI Policy Note). Dr. Hassan Mohamed Nazar is also Co-editor of the Volume 20 of the African Development Perspectives Yearbook. He is Senior Science and Technology Specialist for the Arab States in UNESCO’s Cairo Office since 2009. He has massively contributed to the Introductory Unit 1 for Volume 20 (together with Professor Karl Wohlmuth), and he has participated as a speaker at the Launch Event for volumes 18 and 19 of the Yearbook in Kigali, Rwanda in October 2016 at the invitation of UNECA. In the Unit 2 on Sudan for Volume 20 he contributed with an essay on the role of agricultural research for increasing agricultural yields in Sudan, an essay which was written in cooperation with Migdam E. Abdelgani. Dr. Hassan Mohamed Nazar has also established the Sudan Knowledge (SK) Platform to make the intellectual capacities of the Sudanese researchers and other experts and policymakers known more widely and to allow for a broader use of these capacities for development. The SK Platform is a strong network of researchers, policy makers, educators, consultants and employers from all parts of the world to exchange knowledge and experience and to discuss current developments and challenges. This Directory of Capacities of the Sudanese can be used to help find, support and collaborate with experts from the SK network. The Sudan Knowledge Network aims also to bring together researchers and experts from the Diaspora (see the various links: http://www.sudanknowledge.org/network/name/nazar-hassan/, and: http://www.sudanknowledge.org/network/locality/Cairo/, and: http://www.sudanknowledge.org/network/country/Egypt/). Migdam E. Abdelgani, from the National Centre for Research (NCR), is known for his study (in cooperation with other Sudanese researchers) about “Potential Production and Application of Biofertilizers in Sudan”, published in the Pakistan Journal of Nutrition 9 (9), pp. 926-934, 2010 (link: www.sustech.edu/staff_publications/20100822070957958.pdf). These ideas are relevant for an agricultural transformation strategy which is part of the economic revitalization programme for Sudan. Dr. Mohamed Elhaj Mustafa Ali, as the author on the essay about knowledge spillovers from foreign investors to domestic firms in Sudan, is lecturer at the University of Kassala and at the Sudan International University (link: http://www.siu-sd.com/). 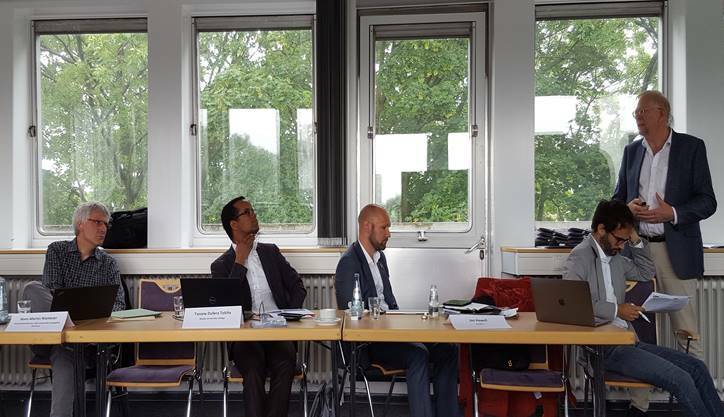 He is expert on foreign direct investment in Sudan and has recently published a Policy Brief on the relevant issues of foreign investment in Sudan in Bremen at the SERG/IWIM platforms (see the PDF: Mustafa Ali -Policy Brief). He has also published a Policy Brief for the Economic Research Forum (ERF) in Cairo on “Measures to Protect Poor Sudanese Households from the Risks of Catastrophic Health Expenditures” (see the PDF: PB28-Mustafa Ali). There are intentions to continue to cooperate in the future on the most important issues of STI development for Sudan. The Sudan Economy Research Group (SERG) Discussion Paper Series is still open for researchers from Sudan to publish on these most important issues (see the links to the series: http://www.karl-wohlmuth.de/serg_sudan_discussion_papers/, and: http://www.iwim.uni-bremen.de/publikationen/pub-sudan.htm). The outline of a new development strategy for Sudan was prepared by Dr. Mohamed al Murtada Mustafa. Dr. Murtada was the first permanent Undersecretary for Labour in the Sudan, the Director of the African Regional Labour Administration Centre (ARLAC) for the English-speaking African countries in Harare, Zimbabwe, and then the Director of the International Labour Office in Egypt before retiring to academic and philanthropic endeavours in Khartoum. He was educated at Addis Ababa University, Harvard University, the University of Wisconsin, Northeastern University, and the International Institute for Labour Studies in Geneva. Dr. Murtada was an early collaborator of the Sudan Economy Research Group (SERG) in Bremen. He has supported the research work on Sudan in Bremen tremendously. Now he pays again tribute to his country by presenting to key policymakers the contours of a new development strategy for Sudan which is based on decades of experience as a civil service official and member of the Government of Sudan and as an employee and head of offices of the ILO with working times in Khartoum, Geneva, Harare, and Cairo. Dr. Murtada has published in IWIM publication series, such as in the SERG Discussion Paper Series, but also in the IWIM Book Series (see the link to the IWIM Homepage, Publications: http://www.iwim.uni-bremen.de/publikationen/index.html). The earliest studies by the International Labour Office (ILO) in conjunction with the Sudanese Government (Ministry of Labour) and the University of Bremen (SERG) in 1976 up to today repeat almost the same recommendations to enhance and improve the Sudanese economy. The recommendations were, just to mention some key ones: Improve infrastructure; develop industry; link agriculture to manufacturing; increase vocational and technical training; reform taxes to encourage industry and exports; support small industries, the vulnerable people, and remote regions; institute rule of law; ensure contract enforcement and transparency to encourage foreign investment; and provide for sustainable economic policies via effective institutions and a responsible macroeconomic policy formation. Whether from lack of political will, leadership, economic means, or external financial investment, the neglect of all these recommendations along with conflict, civil war and international sanctions has continued to disintegrate the development options in the Sudan. After decades of conflict and civil war, the government of Sudan now faces the burden of reconstructing the country, the society and its economy, of repatriating internally displaced persons (IDPs) and providing training and jobs for them in urban and rural areas, also to replace redundant cattle-herding livelihoods and to initiate agricultural projects for food security in depleted environments. While the discovery of oil brought revenue before the great country of the Sudan split into two republics, the oil money was not properly used to expand and to develop the economy. The agricultural sector, the industrial sector, the civil service, and the education sector deteriorated from the satisfactory state they were left in by the British at independence. Although the country since independence has presented a lot of plans and programmes, implementation was always weak or non-existent. This strategy paper by Dr. Murtada outlines changes which are necessary to get the economy back on track in five major sectors stemming from and supporting institutional revisions: education, entrepreneurship, agriculture, industry, and management. While the short-term and the long-term solutions are outlined, the Sudanese people themselves need to pull together, to stop competing for power and land, to produce and support fresh leaders, and to begin to consider the long-term conditions of the country for the good of its own people. The Strategy Paper is structured as follows: After the Introduction (section 1) the section 2 is on Building Capacity, Growth, and Employment through Education, with Recommendations for Education. The section 3 is on Combatting Unemployment, Promoting Growth through Entrepreneurship, with Recommendations for Entrepreneurship. Section. Section 4 is on Improving Growth and Employment through Agriculture, with Recommendations for Agriculture. The section 5 is on. Growth and Employment through Industry, with Recommendations for Industry. The section 6 is on Management, by Improving Civil Service, People, Goods, and Resources, with Recommendations for Management. Section 7 is on. Results of Past Efforts and Lessons Learned. The Section 8 is Towards a New Strategy. And the final section 9 is on Conclusions, followed by References on the history of policymaking in Sudan. Professor Karl Wohlmuth from the University of Bremen has given advice to the author during the process of finalizing the Strategy Paper and has peer-reviewed the paper. The research on Sudan and South Sudan is continuing at the University of Bremen (see the links to the websites: http://www.iwim.uni-bremen.de/forschung/forsch-sudan.htm and: http://www.iwim.uni-bremen.de/africa/Sudanforschung.htm). Professor Reuben Adeolu Alabi, Guest Researcher at the Faculty of Economics and Business Studies, University of Bremen, was invited by the African Department of IMF to do researches over February and March 2018 at the IMF Headquarters on The Pro-Poorness Of The Electronic Fertilizer Subsidy Programme And Its Implications On Food Security In Nigeria. Professor Alabi will continue his researches on the Electronic Fertilizer Subsidy Programme Nigeria (EFSPN) which he started in Bremen during his research stay since 2015. The EFSPN Scheme is considered as innovative and as a model for other African countries. It was introduced by Akinwumi Adesina, since 2015 acting as the President of the African Development Bank, in the time when he served as Nigeria's Minister of Agriculture and Rural Development. Until his appointment as Minister in 2010, he was Vice President of Policy and Partnerships for the Alliance for a Green Revolution in Africa (AGRA). The shortcomings associated with the fertilizer subsidy scheme led Nigeria to adopt the Growth Enhancement Subsidy Scheme (GESS) in 2011. In this scheme the private sector plays the role of supplying and distributing fertilizer, while the government is involved in the registration of the beneficiaries and the payment of 50% of the cost of fertilizer and of other agro-inputs received by the farmers. The scheme delivers subsidized agricultural inputs to farmers through an electronic wallet (e-wallet) system. With unique voucher numbers that are delivered to their phones, farmers then redeem their input allocation from accredited agro-dealers. It is expected that this scheme will improve agricultural input distribution and marketing. In addition, it should provide incentives to encourage actors along the fertilizer value chain to work together towards the common purpose of improving agricultural productivity, household food security, and income. The hope is that this would better serve the intended beneficiaries who are farmers and reduce the fiscal burden of a universal fertilizer subsidy from the government thus making it more effective. However, there is need to find out if this new scheme is pro-poor and to test its impact on the fertilizer use and the productivity of the farmers in Nigeria. Professor Alabi will continue his researches about the pro-poorness of the programme in Washington D.C. at the IMF Headquarters, and will advise the IMF staff on the relevance of the system for other African countries. The new fertilizer subsidy scheme of Nigeria is also revolutionizing the finance system in rural areas of Nigeria (see: http://www.cgap.org/blog/bringing-mobile-wallets-nigerian-farmers). This analysis is part of the programme “Food Security and Agricultural Transformation in Nigeria” which is done by Professor Alabi in Bremen in cooperation with Professor Karl Wohlmuth, who is advising the research programme since 2015. The two professors have now finalized a Unit of Volume 20 of the African Development Perspectives Yearbook on “Science, Technology and Innovation (STI) Policies for Agricultural Transformation in Nigeria”. The Unit on Nigeria has an Introduction written by the two professors on the issues, the contributions and the proposed strategy for Nigeria. New tools for agricultural transformation are considered, such as using indigenous agricultural technologies, developing Genetically Modified (GM) crops, and implementing Food Fortification strategies in Nigeria. A critical evaluation of these new tools is presented. 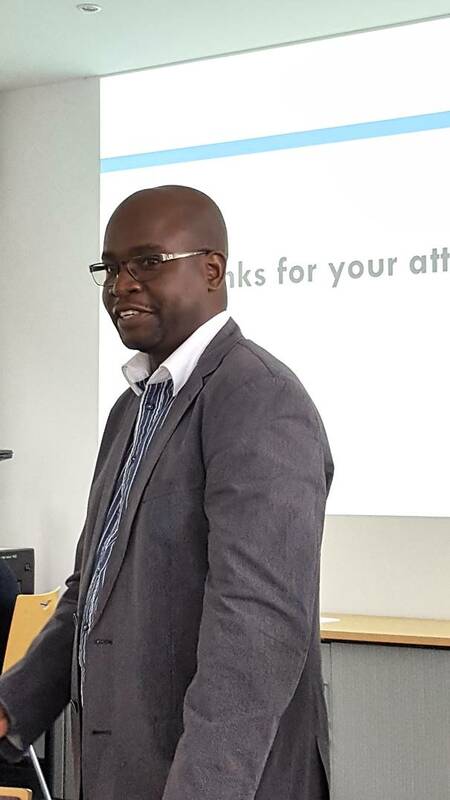 Professor Alabi will continue his researches in Bremen until 2020. He has published widely in the IWIM publications series and he is acting as a co-editor of the African Development Perspectives Yearbook. Professor Wohlmuth supports the programme since 2015 as a senior adviser. “Science, Technology and Innovation Policies for Inclusive Growth in Africa" – this is the title of two forthcoming volumes of the African Development Perspectives Yearbook which are prepared now by a group of international experts. The Editorial Committee of the African Development Perspectives Yearbook has decided to split the scheduled volume 20 (for 2018) into two volumes, the volume 20 (for 2018) and the volume 21 (for 2019). This was considered as advisable because of the great number of high quality submissions of manuscripts to the Editors. While Volume 20 will consider Basic Issues of STI (Science, Technology and Innovation) policies in Africa and Country Cases for Sub-Saharan Africa, the Volume 21 will present Issues of Human Resources Development in the Digital Age, Country Cases for North Africa, and Book Reviews and Book Notes. In Volume 20 of the African Development Perspectives Yearbook essays on the linkages of inclusive growth, sustainable development and STI policies will be presented in the Introductory Unit. Also successful cases of STI development in Africa and STI systemic issues will be analysed. Focus countries are Sudan and Nigeria. Professor Samia Satti Nour, Khartoum University, Sudan and Professor Reuben A. Alabi, Ambrose Alli University, Ekpoma, Nigeria and currently Guest Researcher at IWIM/University of Bremen, were nominated as co-editors of the Units on Sudan and Nigeria and as Volume Editors; both have accepted the invitation. UNESCO Regional Science Policy Adviser Hassan Nazar, UNESCO Cairo Office, Egypt will be the co-editor of the Unit on Basic Issues of STI policies in Africa. For Volume 21 (2019) essays are prepared for a Unit on Human Resources Development in Africa in the Digital Age, based on case studies for Cameroon and Nigeria. Country cases in North Africa are Egypt, Tunisia and Algeria. As usual, a strong Unit on Book Reviews and Book Notes rounds up the Volume 21. Again, UNESCO Regional Science Policy Adviser Hassan Nazar, UNESCO Office Cairo, Egypt will be the co-editor of the Unit on North Africa. Professor Achim Gutowski is again responsible for the Unit with Book Reviews and Book Notes. Professor Tobias Knedlik as the Managing Editor and Professor Karl Wohlmuth as the Scientific Co-ordinator are the other volume editors for the two forthcoming issues. The African Development Perspectives Yearbook has over the decades - the first volume has appeared in 1989 – become the major English-language publication on Africa in Germany. The response to the annual International Calls for Papers is huge, with an increasing interest on the side of African experts and experts from international and regional African organisations. UNCTAD/ Geneva, UNESCO/ Cairo, and the African Capacity Building Foundation (ACBF)/Nairobi, Kenya are the institutional cooperation partners for these two volumes. UNECA in Kigali, Rwanda has organized the book launch for the volumes 18 and 19 of the African Development Perspectives Yearbook in October 2016. This was a great event, with TV appearances in 48 African countries. The Research Group on African Development Perspectives Bremen, which is editing the Yearbook, is also involved in researches, advisory work, and training activities. In 2019 the Research Group will celebrate the “30 years birthday ceremony” of the African Development Perspectives Yearbook.